My precious son finally got the Power Rangers costume he has longed for. He has waited nearly a year for this particular costume…not just any Power Rangers costume, but the Operation Overdrive Red Ranger costume. You know, it’s like the red ryder bb gun from A Christmas Story. Click the picture for more information about this costume from Amazon. He worked hard and finished up the school year strong after having a very difficult beginning and middle of the year. He went to school very day after starting at the new school, except for the day he was very sick. He had a few rough mornings, but when all was said and done, he got out of the car and went in the building. That was his main goal for the end of the school year transition period and he was successful. 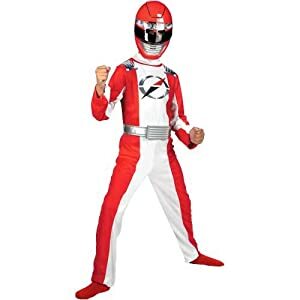 Since he met that goal, Friday he came home with this most sought after Operation Overdrive Red Ranger costume. He did not wear it at school, despite being given the opportunity. I guess he does have at least a little knowledge of what is and is not cool at his age. Wearing a Power Ranger costume in school is definitely not cool! However, before we got from in front of his school he was donning the new attire and oh so proud of how well it fit! As soon as we got home he asked if we could go to McDonald’s to play. Despite 3 littles who were donning their own new attire of a respiratory virus, I reluctantly agreed. He had worked so hard and I knew he wanted to go to the McDonald’s with the huge play area because there would surely be some other kids there to partake in the Power Rangers adventures. When we got there, a little girl was lost in the top of the play area and crying. Her dad was unable to get up to the top to help her, so D offered to come to her aide. With permission, he scurried up to her rescue. He helped her find her way through the maze of nets and tunnels to the slide and she was able to get down and then play without assistance most of the rest of their visit. My mama heart swelled with pride. A few minutes later, a little boy about Samoo’s size could not get up the steps to wander through the hours of adventure that could be found at the top. Again, D asked permission of the little one’s parents and then ran to his rescue. He taught the little guy how to climb to the top using his feet to grab onto the netting so that he could have a boost to the next platform on the staircase. Within a few minutes the little boy was doing it on his own and my heart melted that my son was being so helpful to another little one. After D had his chicken sandwich only ketchup (I know… I know… I’m sure you and I have the same thoughts on that), it was time for that first little girl to go home. Her mom and dad were telling her to come down and she was sure she couldn’t remember the way. D asked if they would like his help again and with their permission, he helped her navigate her way to the bottom of the play area. My mama heart felt great to see him being so compassionate and gentle with her. It’s because I finally have the Operation Overdrive Red Ranger costume. Finally, I am really, truly the Red Ranger and I do good things because I am the Red Ranger and that’s what the Power Rangers do. Yes, my dear son, you are the Red Ranger…you are also really, truly autistic. No arguing about it! What made me think that? D does not have the normal 10 year old boy obsession that makes him want to work hard to earn the next level in a game or to earn the money to buy another book in a series, set of cards, or whatever. D’s obsessions truly drive his every breath and thought. He cannot deviate from the thoughts of whatever his obsession is. While D has had temporary other obsessions over the past year or so, he has always had in the back of his mind a scheme or plan to get that Power Ranger costume. Oh, and did I mention, we could have bought him a red Power Ranger costume nearly any time, but he couldn’t have just any costume, it had to be that costume. In addition, even his psychiatrist agreed it was a bit much that he is so obsessed with being the Red Ranger that he knows every word and move from every episode of Operation Overdrive and reenacts them endlessly. He has never sat to actually watch an episode of this show, instead he has studied every move made by the Red Ranger to the point of being able to mimic them without fault. Finally, D truly believes that when he puts that costume on, he is that character. He has never believed that he could pretend to be a red ranger. While yes, he reenacts it, he was never pretending to be the red ranger because he did not have that costume. In the world of autism for D, there is no pretend play. It either is, or it isn’t. Either he is that character or he isn’t. There is no way to explain to him, Son, when I was a little girl, I pretended to be Strawberry Shortcake. I had friends that would play the other characters and we had a great time. We never, ever had outfits or costumes that were identical to the one of the characters, we just pretended our clothes looked like theirs. That logic does not work with a him, his world is black or white, no grey, no pretend, no make believe. It just is. Yes, I giggled to myself after he proclaimed himself to really, truly be the Red Ranger. What I really did, though, was thought about all of those who never believed me when I told them my son was on the autism spectrum because he was too social, too verbal, able to pick up on social cues (which I’m still waiting for THAT to be explained), able to pretend play, able to play with others, and so on. I don’t care, though. The fact is, D was fearfully made by God and God knows the plans He has for D. D is the person he is because God made him this way. While yes, I’d do anything in my power to take away the pain and heartache my sweet boy feels because of his autism, I would not want to change who he is in the core of his being. I may not like autism, but I love my son and the quirks that make him who he is! **No pics of him in the costume because he won’t be still long enough. Soon, I hope. Next Post Top 10 Tuesday (on Wednesday): What I’ve learned this week. What a beautiful post! It sounds like you and your son had an amazing day. Praying blessings for both of you!! Thank you so much, Becky! I just poked around your blog, what a beautiful family! Praying for blessings for your family as well! My precious D. He truly is a wonderful child. Yes, I know he has his moments when he can’t control himself, but look at how he loves to help others. I pray daily for him and for you and your family. Much love to you! Thank you so much, Joy! I just love you. He is so precious and he makes me so proud, such a great heart in that sweet little body!